"I played Jeremiah Johnson like this! ": Robert Redford stars as Forrest Tucker in The Old Man & the Gun. Whether it turns out to be or not, it's a hell of a lot of fun to watch, not least because it purrs along on Redford's artisanal fuel mixture of charisma and (apparent) effortlessness that made him a legend in the first place. Which is a polite way of saying his turn as the avuncular and gentlemanly bank robber Forrest Tucker doesn't demand terribly much of the actor. There are no moments of heightened emotion, for instance, no searing monologues, no crying jags, no causes to rend his garments or gnash his dentures [Ed. note: You said you were done!]. Indeed, nothing in the script calls for him to widen those familiar blue eyes even slightly. What he does instead is smile — unceasingly, beatifically, crink...ily – at the bank tellers he's robbing, at his partners-in-crime Tom Waits and Danny Glover, at Casey Affleck's disquietingly mumbly cop who's leading the manhunt, and, especially, at love interest Jewel (Sissy Spacek). Be warned: You will emerge from The Old Man & the Gun freshly inspired by the sight of Sissy Spacek onscreen, being all charming and flinty and wonderful – and freshly incensed at a Hollywood that has denied us the opportunity to bask in that particular sight more often. Lowery based the film on a 2003 New Yorker piece by David Grann about the real Forrest Tucker, a career criminal who escaped prison many, many times over the course of his long life. Lowery, smartly, focuses on a single, late-in-life crime spree, and stacks the deck in Tucker's favor by having him never pull a gun on anyone, by supplying him with Glover and Waits as amiably grizzled accomplices (Waits' brief monologue about Christmas should become a venerable holiday tradition), and, not for nothing, by having him portrayed by Robert Frickin' Redford. Such a pleasant, old-school diversion isn't the kind of thing you'd necessarily expect from Lowery, whose most recent film was 2017's sad and matter-of-factly surreal A Ghost Story. I didn't care much for his twee Pete's Dragon (2016), and certainly his 2013 modern Western Ain't Them Bodies Saints and St. Nick (2009) share some of Old Man's low-fi, outlaw-on-the-run DNA, though both of those films felt a good deal more urgent and searching and earnest. As a writer and director, he concerns himself with those on the periphery – but Redford's Tucker, unlike previous Lowery protagonists, remains untouched by melancholy or regret. Instead, he quietly revels in the isolation of his outlaw status. This serves to lower the film's stakes considerably, yes, but it also makes it go down easier than Lowery's more downbeat past offerings. 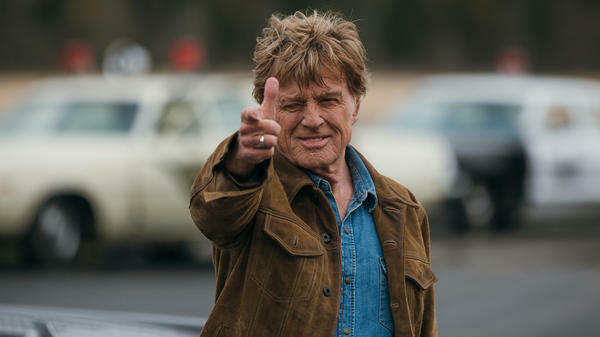 Redford is 82 years old, and if he chooses to make The Old Man & the Gun his final onscreen performance, it's perhaps fitting. In films like The Sting and Butch Cassidy and The Sundance Kid, he used his preternatural affability to deliver indelibly enjoyable work. The Old Man and the Gun is just as light as those films, albeit a good deal more slight. Who are we to begrudge him, then, should he choose to end his career not with some dazzling, strenuous, go-for-broke tap dance, but instead with this agreeable cakewalk? As swan songs go, it's got a nice beat, and it's easy to dance to.